A major Asian chip manufacturer cut its revenue forecast for the year, citing uncertainty in cryptocurrency “mining” demand as a factor. Taiwan Semiconductor Manufacturing, or TSMC, is the largest semiconductor foundry company in the world. Bernstein analysts estimate the majority of demand for TSMC’s special cryptocurrency mining chips comes from Bitmain, a secretive Chinese company that has become the industry leader for selling hardware to create bitcoins by mining. “We forecast TSMC’s 2018 revenue in U.S. dollar will be about 10 percent, rather than the previously indicated 10 percent to 15 percent, due to the smartphone weakness and the uncertainty in cryptocurrency mining demand,” C.C. Wei, co-chief executive officer and president, said Thursday, according to a FactSet transcript of the company’s earnings call. In addition to key smartphone components, the Taiwanese company makes chips designed to perform calculations needed to verify cryptocurrency transactions in a process known as “mining.” In return for solving complex mathematical equations, miners receive bitcoin, which was trading near $8,200 Thursday, according to CoinDesk. Just as Wall Street tends to watch semiconductor stocks as an indicator of Apple iPhone demand, the chipmaker industry may also signal how last year’s euphoria around cryptocurrencies could be fading. First quarter demand from cryptocurrency mining was strong and could continue in the second quarter, TSMC said Thursday. But the company said it could see some weaker demand in the 28-nanometer product line used for cryptocurrency mining hardware. Morgan Stanley estimates that about 10 percent of Taiwan Semiconductor’s revenue now depends on cryptocurrency mining demand. 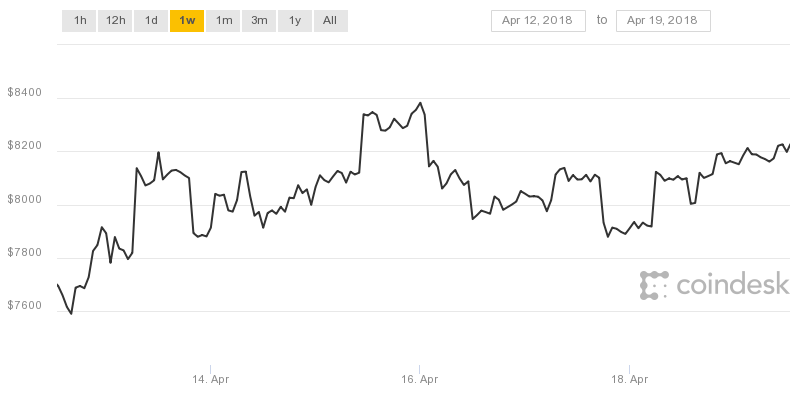 If bitcoin’s price were to drop, that could cut further into TSMC’s lowered revenue forecast, equity analyst Charlie Chan and his team said in a note Thursday. “Even if the Bitcoin price stays the same in 2H18, we believe mining profits would drop rapidly, according to our simulation,” the report said. Bitcoin has been volatile this year, and has lost more than half its value since the cryptocurrency reached a high above $19,000 in December. Its price has remained in a trading range this year amid regulatory uncertainty and tax-related selling. Cryptocurrency mining chips accounted for 4.5 percent of TSMC’s total revenue in the third quarter of last year, contributing to a total $900 million or 2.8 percent in revenue for 2017, according to a Bernstein report in February. Beijing-based Bitmain is one of the top five buyers of TSMC chips and made $3 billion to $4 billion in operating profit in 2017, on par with chipmaker Nvidia, the Bernstein analysts said. TSMC also manufactures chips for leading technology firms such as Apple and Nvidia, which were both trading 1.4 percent lower following the earnings report Thursday. Shares of Taiwan Semiconductor Manufacturing meanwhile fell about 5 percent. Taiwan Semiconductor Manufacturing said its revenue forecast range for its second quarter is $7.8 billion to $7.9 billion versus the Wall Street estimate of $8.8 billion.